During this time of Advent, the spirit of giving is strong at San Lorenzo Ruiz CES. While so many children are still in the process of writing up their own Christmas gift list, the students at San Lorenzo Ruiz CES in Markham are experiencing the magic of giving to others. Under the leadership of the Luke 4:18 Committee, students have created a “Hat and Mitten Tree”, which is adorned with donated colourful hats and mittens. The school will continue to collect new hats and mittens until December 12, at which time all donated items will be boxed and donated so they can bring warmth to local families in need. 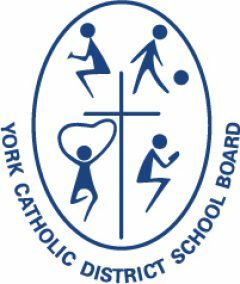 San Lorenzo Ruiz is also one of many York Catholic schools that have partnered with York Regional Police to support its “Holiday Heroes” campaign. 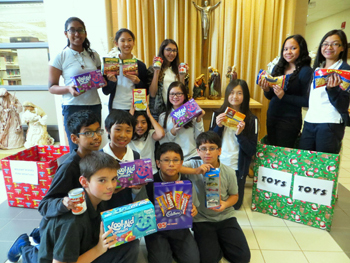 From November 13 – December 12, the school’s Luke 4:18 students have been collecting non-perishable food items and toys for the YRP campaign. “As we continue our Advent journey, let us all prepare our hearts for the coming of Jesus by remembering those less fortunate than ourselves,” said Teresa Lombardo, Principal. Items can be dropped off to San Lorenzo Ruiz Catholic School, 840 Bur Oak Avenue, Markham.